Down is the most effective, commonly available insulator known to man. So long as you keep it dry. But, new hydrophobic down coatings promise to retain its warmth when wet. 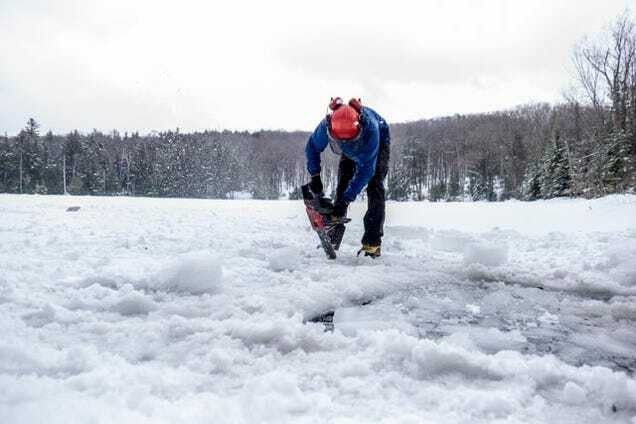 We tested that claim by cutting a hole in a frozen lake and jumping through it. But before we get to the money shots of me freezing my balls off in the name of science, time for a brief explainer. Traditionally, down insulation, made with the feathers of duck and geese, has ticked all the boxes for insulation: great warmth, ridiculously light weight, and huge compressibility. 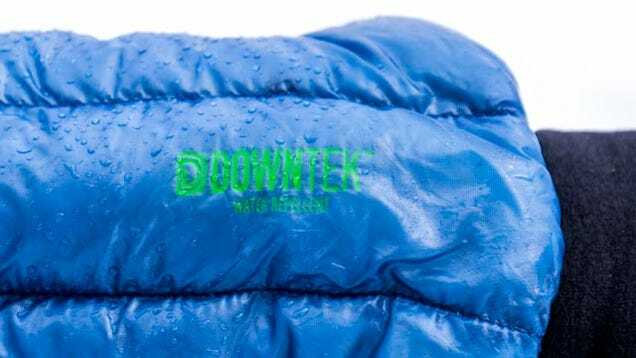 The only drawback: If you get your high-end sleeping bag or jacket wet, it’s game over. In recent years, manufacturers have sought to address this by filling their garments with hydrophobic down: the same duck/goose feathers, just now treated with a coating to prevent the down from absorbing moisture. The exact process varies with different manufacturers of hydrophobic down, but the end result is normally the same: where regular down becomes useless on contact with water, hydrophobic down retains its loft, and therefore its ability to keep you from freezing to death. It all sounds great, and it definitely works in the lab — you can see my highly scientific test above — but you’re not going to care about shake-jar tests when you’ve just soaked your sleeping bag two days away from civilisation. 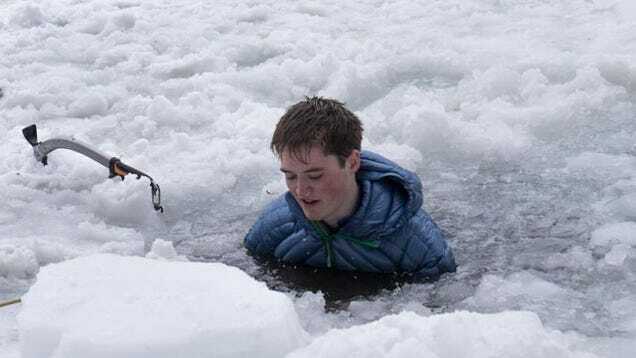 So, I came up with the most brutal real-world torture test I could think of: I would jump into a frozen lake wearing a hydrophobic down jacket, stay in there for a few minutes, jump out, and see if I got hypothermia. Science. The jacket in question was a Big Agnes Third Pitch, an ultralight mid-layer, filled with 180g of DownTek water repellent down. It’s designed to be worn as part of a layering system, under a shell, in fairly cold (but not Arctic) conditions. I’ve been wearing it skiing and climbing for the last few weeks, and combined with a synthetic baselayer, it’s good down to about -9. To read more about effective layering for both maximum warmth and variable performance, click here. So, on Monday afternoon, I jumped in a car with a friend, and headed north for an hour, towards a small, out-of-the-way lake I knew of. Probably the hardest part of this experiment was actually making a hole in the ice big enough to jump in. It’s generally been above freezing for the last two weeks, so we assumed the ice would be pretty thin by this stage. Wrong. So wrong. Our first attempt to make a hole was 30-40 feet from the shore. We’d brought along a chainsaw, because we’re lazy (plus chainsaw! ), but the foot-long blade didn’t come close to cutting through the ice. We moved closer to the shore, but same deal. Our final idea was to find the outflow, where water was still running, and work backwards from that. This was a bit smarter, and after a solid two hours with a hatchet and chainsaw, we’d cut a channel far enough into the lake to have a decent hole. 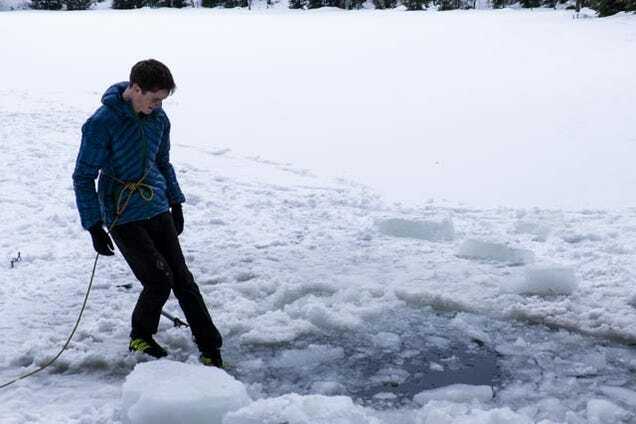 New lesson learned: cutting through ice is way, way harder than we’d thought. Anyway. I had my hole, I had the jacket on over a single thin baselayer, and I couldn’t really chicken out any longer. With a safety line on (frozen water can do weird things to your ability to breathe/move) I jumped in, ducked down (the water came up to just under my arms), and sat there while my ‘friend’ alternately laughed and took photos. After a good minute of immersion, and with the water starting to get really bloody cold, I hopped out. Things looked pretty good straight away: The jacket wasn’t heavy, and the pockets of down were still puffy, inflated, and holding in what little heat was left in my core. I went for a lap around the lake — after being immersed in cold water, the best way to get warm is to get moving — and by the time I got back, my core was as warm as it’d been before the little swim. By comparison, my legs, hands and toes, lacking any down insulation, were really unpleasantly cold. In the name of science (and for the sake of more photos; I suffer for my writing), I decided to go a second round. The lake was just as cold the second time around, and the down just as non-absorbent. I was completely convinced the tech worked, so I retreated back to a fire to nurse my poor, frozen fingers. Immersion in a frozen lake isn’t something that happens to most of us (hopefully). But far more realistic is a jacket soaking through with sweat or rain, or a sleeping bag getting wet with condensation overnight — all of which will completely ruin a trip, especially an overnight. A wet bag is never fun, but hydrophobic down means you’ll probably survive where you might not with regular down. What does that mean for you? Well, when you’re buying an insulative jacket, or a sleeping bag, you’ve got three choices: synthetic fill, which is heavy, cheap, and warm when wet; regular down, which is light and warm so long as you keep it dry; and hydrophobic down, which is the best of both worlds. But really, there’s two choices now: synthetic insulation, if you’re on a budget and don’t care so much about weight; and hydrophobic down, if you want the best performance, screw the price. I absolutely would not buy anything with regular down any more. It’s just not worth it. There are a bunch of different brands of hydrophobic down on the market — DriDown,DownTek, Nikwax Hydrophobic Down and Primaloft's Gold Down Blend (a 70/30 mix of down/synthetic) being the most widely used. Thankfully, the International Down and Feather Testing Laboratory (yep, that's a thing) has created a standard: any down marketed as 'hydrophobic' or 'water repellent' has to withstand at least 40 minutes of being shaken in a jar full of water. Precise performance varies above that, but the bottom line is this: anything sold as hydrophobic down will retain adequate insulation when wet. Just don't try jumping into a frozen lake at home.